Kamloops, BC: Red Clover, c2011. A fine nonfiction read to follow Taxi!, this brief and clearly stated examination of our monoculture was excellent and thought-provoking. What is the monoculture? It's one story that takes over and becomes the lens through which our culture interprets and understands everything around us. 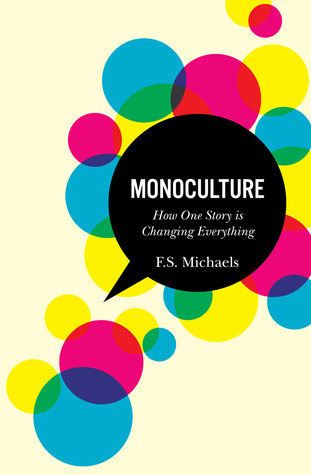 Michaels posits, very convincingly, that our current monoculture is an Economic one, that all parts of life are judged in a transactional manner. Whether it's relationships to other people, nature, spirituality, education, work or creativity, an economic lens limits how we can interact. Transactional relationships limit our committment and interconnection to just one interaction, the one in which we are exchanging whatever it is, rather than allowing us to develop relationships which are long-term, engaged, and responsible for one another. Each chapter is brief and clearly argued, and builds to the next. Over the length of the book, different aspects of how a monoculture shapes us individually are drawn out and highlighted. And there are some ideas about how to think yourself outside of the one story. I would have liked to see more of a direct "action plan" somewhere in the book to help people strategize further, but really, self-education and knowledge seem to be the key to unlocking your tunnel vision. There is a lengthy section in the Community chapter about the public good and how Economics isn't always the best way to view the viability of public services. The example that Michaels uses is public libraries, and she argues that letting corporate services and philosophies take over libraries is very much NOT in the public good. I must admit she's preaching to the choir here -- I also believe much of what she shares about the direction of public libraries in an Economic monoculture. I love that she makes so clear why libraries are powerful and need their independence, and that she shares a very good bibliography in this area, as well as the others she tackles. She points out over and over again, in most chapters, that the needs and values of profit-driven corporations don't always reflect what we might think of as the "good life" in terms of human connection. I really enjoyed this read. It's thorough, well-argued, and not even close to being a screed. It's balanced and thoughtful, and brings up many, many points that are calmly made obvious. It makes you question your own assumptions, and allows you to see life differently. And as she says, life is about many stories, not just the One story. Widen your narrative and enrich your life. I'll leave you with a brief quote that summarizes why it's important to widen your life story. When you conform to the monoculture's version of who you are and what the world is like, you lose your freedom along with your ability to be truly innovative in terms of your own life. Being able to draw on many different stories, not just the economic one, allows you to creatively and authentically meet the challenges that face you in your life. The monoculture, determinedly single-minded, insists that economic values and assumptions can be used to solve your problems, whether those problems are spiritual, political, intellectual, or relational. This book pulls back the curtain on Economic assumptions that rule our culture, now more than ever; although this book was only published in 2011, the Economic worldview seems to have even more firmly grasped our cultural imagination since. This is a necessary read. This sounds like a very interesting, intelligent book. Thank you for another excellent review. Absolutely! A lot to think about in this one but it's also very accessible. I absolutely loved this book: so accessible, so profound. And how often is a book both of those things at once?! (Not often.) And you've made me want to reread now: thanks! I recall a few bloggers reading this when it came out and I meant to read it ever since. Yes, it is a great balance. Loved it.